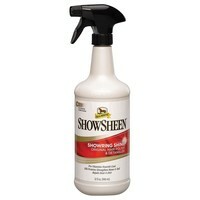 Absorbine Show Sheen Hair Polish & Detangling Spray has been uniquely formulated to provide the ultimate grooming aid to any horse owner. This fantastic hair polish coats each individual shaft to ensure manes and tails stay tangle free, while the conditioning properties nourish the hair and reduces static fly-aways. Using on the body, this polish makes the coat smooth, accentuating the body definition while repelling dust, dirt and other stains. For a seriously good looking horse and a significant reduction in grooming time, the Absorbine Show Sheen Hair Polish & Detangling Spray is perfect!